A thank you letter is a letter that shows gratitude to someone. It is always important to say thank you. If you want to establish and improve a relationship with a particular person, a thank you letter is a perfect instrument to do so. Writing a thank you letter will help you both in your personal life and professional career. In the following guide we will tell you how to write a thank you letter for any occasion. You will learn how to start a thank you letter, what points to consider while writing, and what phrases to use in your letter. 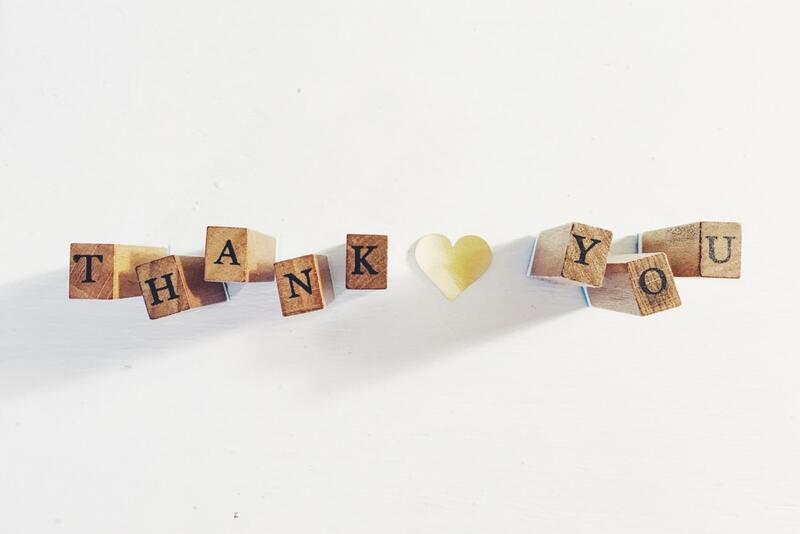 If you need to know how to write a thank you email after interview (it is also called a thank you follow up interview letter), we recommend you to read another guide in our website here. So, basically, you can write a thank you letter for any action that a person has done in your favor. The more unexpected the letter, the more valuable it is. If you are not sure if it’s appropriate to write an appreciation letter, always choose to write. Even if you have thanked in person, sending a thank you letter will also be appreciated. Some situations require or necessitate a thank you letter, and not writing would be considered bad manners. Have you ever received a letter to thank someone? If no, imagine that you have received one. What would you feel? It’s time to learn how to write a good thank you note. 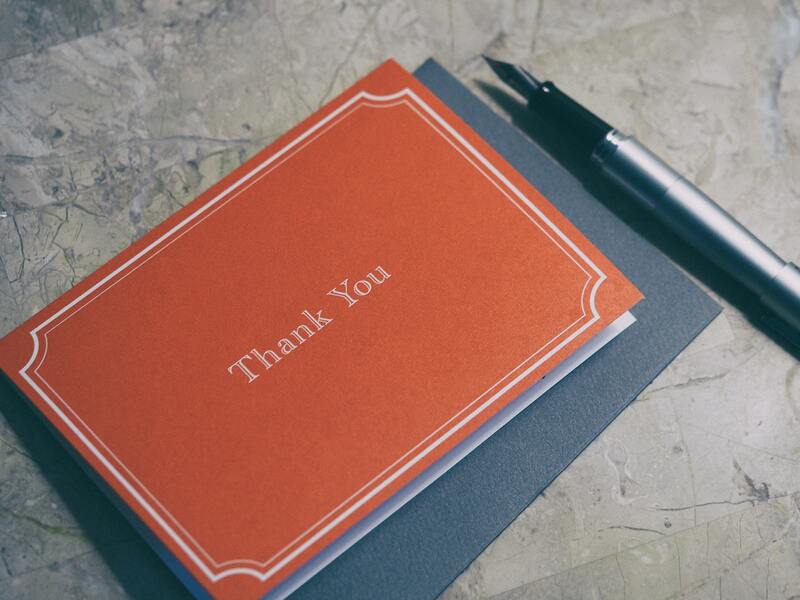 When should you write a thank you letter? It will depend on the situation. It is better to say thank you in a letter as soon as possible. For example, if you were invited for dinner or a special occasion, it would be better to write within one or two days. Today, most thank you letters are sent by email. This format is appropriate for most occasions. If you want to write an emotional thank you letter and send a gift, you can write it by hand and send it with ordinary mail. As an option, you can type the letter and print it on quality paper. 1. Write the email subject. 3. Write the main part of the letter. At the very beginning, tell the reader why you are writing this letter. As you are writing a thank you letter, show your appreciation and how it is important for you. In the next paragraph you can thank the person for the time they spent with you or describe your feelings about the event. Share your positive emotions. Also, you can ask the reader for a specific action. For example, if you’ve received a gift from a friend, you can request them to have lunch as soon as possible. If you are writing a thank you letter for a job interview, tell the person that they can contact you with any questions and that you look forward to speaking again soon. Let’s have a look at the following thank you letter sample. You can use this letter as a template for your future thank you note. Consider the recommendations that our author has made and you will definitely write a good thank you letter. Write as soon as you feel the need to write thankful words to a person. If you wait too long, you can lose enthusiasm and the atmosphere of high spirits. Don’t send a thank you letter for every occasion. You are not obliged to send it to people close to you. Thank you letters should be written for special occasions, business purposes, or for events where you are a guest of honor. If you were provided with overnight hospitality, you can send a gift with a thank you note. Typically, it is food, drinks, flowers, toys, etc. Write sincerely and clearly. Express your enthusiasm to the reader and don’t try to fake your feelings (unless they are negative). Check the letter before sending. Make sure that you have written all names correctly. Correct all the mistakes in the text. Think about the quality of the paper and the envelope if you plan to send the letter via mail. Use high-quality paper only. Create genuine letters. Even if you need to write several letters, try to make it personal. It will avoid an uncomfortable situation if the receivers meet and share their thank you notes. And don’t copy the texts from the internet! Be yourself. Keep the appropriate tone. If you are writing a business thank you letter, stick to a formal tone. While writing to a friend, you may include jokes and informal language. There is no need to compose a long letter. For most situations, a short thank you note will be enough. It is always a pleasure to receive gifts. Usually, it is expected that you will write a thank you note within three days. The “deadline” can be extended up to two weeks. In fact, givers don’t expect your thank you words, they just need to know that the gift has arrived and whether it pleased you. If you have received a get well soon gift, you can write a thank you letter when you restore your strength after the illness. If you have received a solid gift for special occasion, you can send two thank you letters. In the first letter, say that you have received the gift and give thanks for it. In the second letter, tell the sender how you have used the gift. For example, if you have received money as a gift, tell how you have spent it (such as having bought a year-long membership in a fitness center or a porcelain service that you use every day). Sometimes we forget to say thank you to a friend or colleague for the things they do to ease our lives. When you can’t say thank you in person, just write a short thank you email or card. It is a powerful way to show that the person’s contributions are highly appreciated and noticed. While writing a thank you letter seems an easy task, you may experience difficulties with writing an original and sincere letter. Don’t panic! 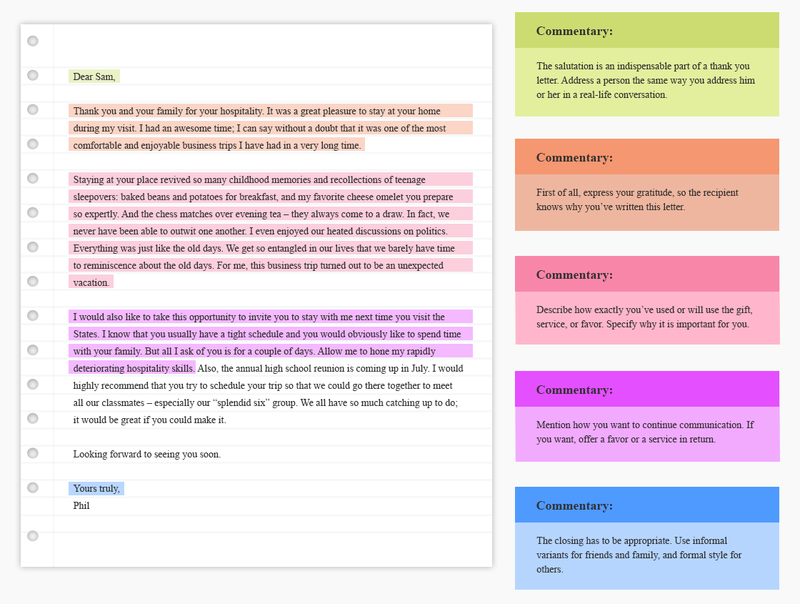 With a bit of practice, you will be writing warm thank you letters easily. How to write a friendly letter you can read on our website. Good luck!